For those who dont have it all. Why do we need these? Why??? Well apparently parents need to make sure that their child’s Poptarts survive their gruelling and violent journey in the school bag of destruction on its long quest from the cupboard to the lunch room. Clearly this plastic device was not invented for breakfast. Of course not! 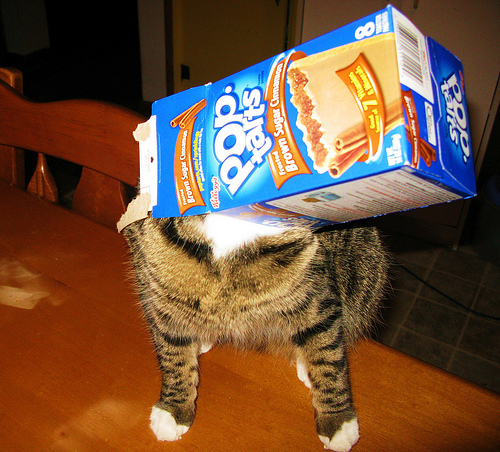 The Poptarts go from cupboard, to toaster, to your chubby little snot’s gullet. It’s not meant for when the kid gets home, that’s when they get their Oreo’s and chocolate covered lard balls!–from the makers of I-Phone. So by process of elimination the answer falls to… lunch. My question is, not only are you agreeing to your child’s request of pumping their stomachs full of icing pastry at lunch time, when they should be consuming something that won’t ensure them a future of ridicule and heavy breathing, but how have they convinced you that their enjoyment of this breakfast treat is being diminished by the corners being snapped off? Never have I once witnessed a child turning their noses up at a Poptart because the ‘ends’ with no icing have broken off! Children everywhere spewing obscenities in frustration over their semi masticated sugar snacks! How about some changes? Let’s stop stupid useless crap like this from being produced! Like those banana hammocks and devices that chop for us. Learn to use a F%$#@&* knife people! We have far too many of these ‘things’ that cost lots of money to produce and take up space we don’t have, to fill a need that’s already available. We have something to protect our Poptarts… It’s called a lunchbox. One day when we stop having all these necessities. We’re all gonna be useless, fat, children yearning for our Poptart containers.